Includes one PRINTED text and one PRINTED Mission Manual (workbook) for all three volumes that will be shipped. No teacher’s manual is required. US orders include free Priority shipping. International orders include free economy shipping (allow two to eight weeks). Includes one bookmark and erasable highlighter per Mission Manual (shipping to the US only). 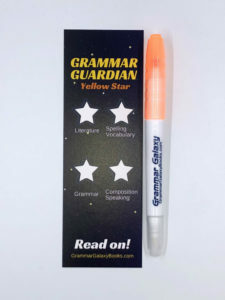 Grammar Galaxy: Yellow Star (Volume 3) is a complete language arts curriculum for 4th graders or above or those who have completed Protostar or its equivalent. *Whose student is a 4th grader or above or has mastered Protostar skills.